Have Friends interested in Cryo? Our Referral Program is HERE! Refer a Friend for a FREE SESSION! Happy Holidays- We Have gifts for you! Here it is Everybody! Our Halo Referral Program, where your friends get a free session and you get rewards! We have been listening, and have answered your call. We all have friends who say they would do Cryotherapy, but just want to try it first before committing to a package or membership. Now we have a solution! Bring a friend with you to your favorite Halo Cryotherapy location, and their first cryotherapy session is on us! 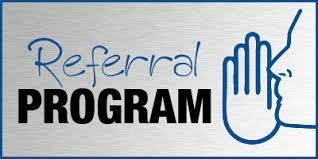 There is also something in it for you, as your referral is the biggest compliment you can give us. If you are a member with us at Halo Cryotherapy, and your friend or family member you referred becomes a member after their free session you receive $10 off of your monthly membership cost. This applies to every person you refer who becomes a member! If you are client who uses session packs, whether its a 4, 10, or 20 pack and you refer a client to us they again receive that first session free. If they make a purchase of any of our packages or memberships during that visit after their freebie, you receive a free session of your choice added onto your account. Everybody wins. You get to freeze with a friend, and they do so for free with no strings attached. If they happen to like it, which we are confident that they will, you get rewarded with free Cryo or discounts on your membership! We also recently added a new service to our Cryotherapy and recovery repertoire, we call it the Halo3. It is so exciting, we combine our 3 most popular services to create a one of a kind experience that makes you feel amazing! This combination of our awesome services takes 25 minutes, and it starts by lounging in our NormaTec Compression Therapy boots or hips while receiving a facial at the same time. We follow that 15 minute combo with a whole body cryotherapy session to complete the experience. It is a full body recovery, circulation & endorphin boost, and beautifying treatment all in one! The total value of the package is $125, but we are offering this Halo3 combo for only $69. Call us at either location in Edina (612-787-2796) or Minnetonka (952-595-5915) inside of Tigerfit to book your Halo3 appointment today! More Exciting news from Halo! Recovering from Thanksgiving? Let Halo Cryotherapy boost the metabolism, burn extra calories, and help you recover between workouts to get back faster & feeling better. Gift Cards coming soon! They are available online and printed from home, but we will have customizable amount Halo Gift cards in store for the holidays soon! Don’t let the cold winter weather scare you away from Cryo! You warm us extremely quickly, it alleviates your aches and stiffness, your metabolism gets a big boost, and it makes 20 degrees feel like a warm breeze.